Axle Diameter 3 5/8" 4" 4.5"
When considering traction bars from both us and other manufacturers there are many things to consider. There is no one size fits all nor perfect kit for every application. There are two main designs on the market; ladder bars and anti wrap bars (single bar designs). Both (properly designed) will work to decrease/prevent axle wrap and wheel hop. Only a ladder bar style (two mounts on the axle) will actually increase wheel traction by transferring additional weight to the rear axle as it tries to lift the front of the bar. This style has been popular among drag racers for decades. We have taken the traditional ladder bar and taken it to a new level. 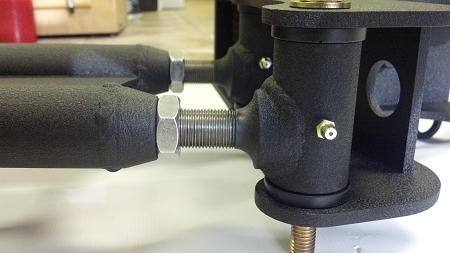 Our design has a "floating" shackle on the frame side to allow the suspension to cycle without bind. This is where our kit gets it name. With the design of our kit, we eliminate axle wrap, wheel hop, and give your truck a secure planted feeling under acceleration and braking. This kit will smooth out harsh shifts and help the truck to launch straight. The triangulated bars are built from 1.5" .120 wall DOM tubing and then gusseted to prevent any unwanted axle movement. Unlike many other bars of similar design on the market we use a forged poly joint on the axle side and uniball joints on the frame side. This prevents squeaks, rattles, and premature replacement of associated parts. Be wary of kits that use heim joints on the axle side. Over time wear will cause them to creak and clunk. Dont be fooled by less expensive setups that will leave you with bent or broken bars. All bushings supplied are heavy duty poly and grease zerks are included to prevent any squeaks. Both the front and rear of the traction bar are adjustable to allow you to fine tune the bars even if suspension lift sizes is later changed. Our kits will work on both single and dual rear truck applications. 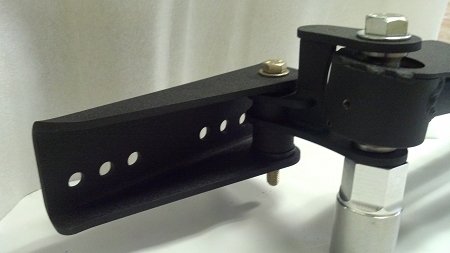 Special Notes: Frame will need to be drilled for front traction bar mount. Additional frame modifications may be needed for the frame mounts depending on skid plate and fuel pump configuration. These are some excellent ladder bars. I highly recommend them. I've bought other stuff from PMF and they continue to provide high quality parts fabricated with care. They also have good customer service. These track bars have been absolutely awesome, I've had them about 4 years now with no issues.